Why is it that you make a million "to do" lists, you start preparing weeks in advance, try and stay on top of things and the last 48-24 hours prior to an event or occasion, everything seems to go crazy? Welcome to my week. I mean, really. I've had every hour strategically orchestrated in preparing for Dainty Button's Grand Opening. I, somehow forgot to put in that hour when it all goes up in smoke. My assistant's brother ended up in the ER, deathly sick and out of all of her 5 children, everyone of them needed her this week. Who am I to try and stand up against a mom and 5 children, right? So, Tuesday all hell broke loose. The panic attacks began, the stress started becoming overwhelming and I became a basket case. See, "worry" runs in my mom's family. Not this, "cautious, careful" thinking but worrying about EVERYTHING. And, unfortunately for me, I inherited this little trait. It's awful. 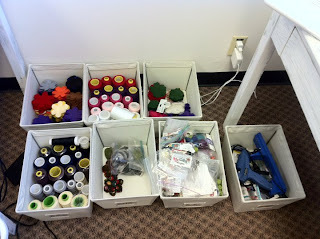 I never intended on going with bins for my studio. I had "shabby chic" ideas about organizing things. The wall that these bins go on had nothing. It was a very boring, blah wall and the chance of it becoming something was very slim. My mom had the idea of the bins and to be honest, I was a little unsure about it at first. But, my mom is usually pretty good on suggesting ideas, so I went with it. I have to say, I'm not disappointed. Looks pretty awesome, I have to say. This, my dear followers, is where all the creativity happens. Excuse the table mess. We were still sorting in bins when this was taken. Each bin has a label. This is perfect when processing orders, working on pieces. It's right in front of you. Even better? These bins are canvas and can be washed. In just a couple days time, this has made my life SO much easier. 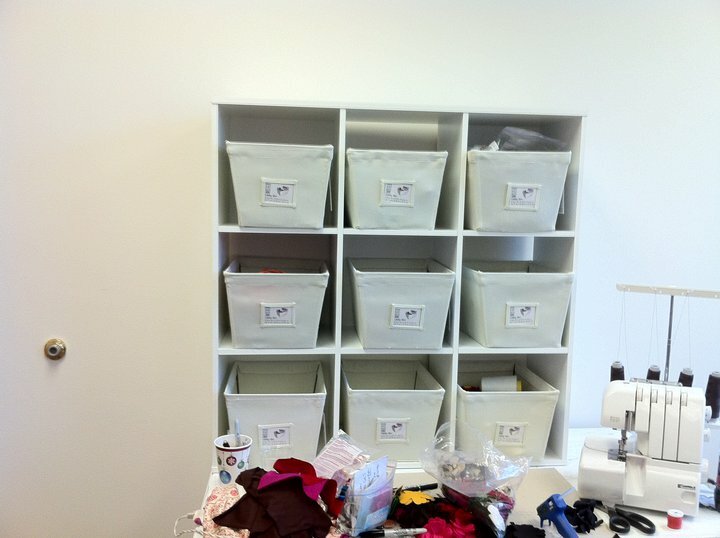 It's amazing what storage bins can do. Another lesson that I learned this week. Sacrifice. As a business owner and Dainty Button, obviously being my income, I jump at the chance for vending at events. Now, I don't go to just anything. Another lesson learned last year but that an entirely different blog. When I scheduled this week out, I had Ladies Landmark yesterday (Thursday), Grand Opening tomorrow and the east coast next week. Throw in out of town company, prepping for this weekend, working on the Spring Line and filling orders. Again, I go back to the fact that I take on too much. The surprising thing about this entire thing is I was actually ready for Ladies Landmark. I say this because when I commit to an event, trunk show, etc., I'm literally putting together pieces as we're walking out the door. This time, I was ready. Since Monday. Ha! The truth is, I was wrestling around with the idea of Ladies Landmark. I wanted to go, but I knew of everything that had to be done here, as well as company flying in on the same day. I decided a choice had to be made. I finally realized I couldn't do it all. I put my health first and decided that this weekend was my priority. That's what I've been praying for. To simplify and be a "wise steward of my time". This is a challenge. But I'm making progress and as I make progress, I see things go smoother, I have more time to just sit and breathe and I finally realize that there is a life outside of work. My cousin once posted something on FB that her husband had said that's so true and has stuck with me. Multi-tasking. Yes, it's great but when you commit to so much, you start spreading yourself very thin and the job is not completed at it's best ability, because you're doing so many different things, versus limiting yourself to what you know you can do and excelling at those. Which is better? So, the rest of the studio? It's getting there. When I say, "getting there", it's the last minute touches that seem to take forever. It's simple things. Like, hanging things on the wall, changing furniture knob fixtures, making sure everything is put together. I have to say, that I have the most amazing friends. They've really stepped in and helped me this week. I even had my out of town, guy friend, putting together leaves and ties for my packaging, last night. God blessed me tremendously when He chose my friends. So, today is the last day to get it all done. There's never enough time in the day and today could possibly be a good example of that. The list is endless. So, in your free time, whisper a quick prayer for me and I can't wait to let everybody see the final touch. Thanks for sharing all of this with me. It's been so much fun and exciting. If you're in the area, I'd love for you to come by tomorrow and help celebrate my big day with me. If you're unable to attend, keep an eye out on details about tomorrow's Spring Line Pre-Sale on etsy. This is a limited 2 hour event. I will be blogging details later in the day. Happy Friday to you!